by MarkLives (@marklives) Keith Rose was the director behind some of South Africa’s most-iconic television advertising, including BMW’s “Mouse” and Allan Gray’s “Beautiful”, to name only two. Rose received accolades from across the globe for his work, from being inducted into the Clio TV Hall of Fame, being selected by Shots as one of its “100 top creative minds of all time” to Campaign magazine naming him among the top five directors in the world. He was also inducted into SA’s Creative Circle Hall of Fame in 2000 and the Loeries Hall of Fame in 2014. He won numerous awards and was president of the Cannes Lions Film Craft jury in 2011. RIP Keith Rose. The ad world has lost a beautiful storyteller and world class artist. We're utterly shocked by the untimely passing of prolific commercial director Keith Rose. We would like to extend our deepest condolences to the family at this difficult time. The Best of Keith Rose. How many do you remember? For Keith Rose: "All men die, but not all men live". And you lived. A true Legend… I'm truly honoured to have had the privilege of working with you and being a part of your team. You always pushed us to do our very best. What an inspiration and mentor to me and so many of us. RIP Keith Rose. One of SA's most celebrated film directors. To the maestro, Rest Easy. Sad to hear SA advertising legend Keith Rose passed away. When looking back at my favourite SA ads most of them had Keith behind them. Honored to have worked with and learned from him. R.I.P Keith Rose. Heard today that our industry has lost one of the greatest commercial directors of our time. RIP Keith Rose. Sincerest condolences to your entire family. RIP Keith Rose. What a talent. Will not be able to make an ad with you again, but blessed for having been exposed to your genius. Salute Keith Rose. Undeniable genius. We will be poorer without him. RIP. A horrible, sad day for anyone and everyone who ever knew or worked with Keith Rose. Such a special talent and special man. His genius, his giggles. Strength and love to his loved one's. This ad is one of reasons that I do what I do. In my opinion it is one of his finest. Today we lose a legend – one that took South African advertising to the global stage with the most stunning storytelling and craft. An inspiration to a few generations of creatives. RIP Keith Rose. Legendary TV commercials director Keith Rose has died. 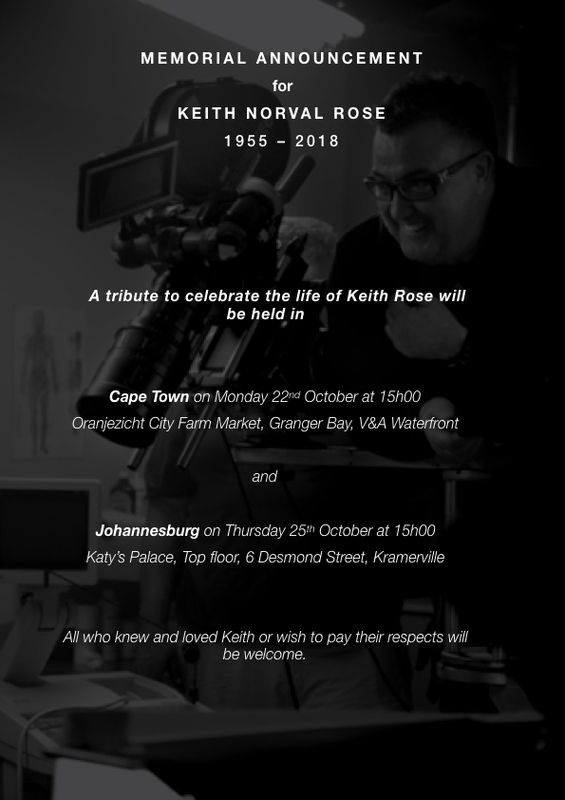 Rest in eternal peace Keith Rose, from all of us at Ogilvy South Africa and our clients. Rest in Peace Keith Rose. The Best of Keith Rose https://t.co/tvDiDNexY2 via @YouTube This was a compilation of scenes from some of his great ads when he was awarded a position is Loeries Hall of Fame in 2014. A huge talent. RIP Keith Rose. A true legend. RIP Keith Rose, a loss to the industry. You set the benchmark for all of us. Oh my word a giant has fallen. RIP Keith. The world is poorer now. R.I.P. Keith Rose. Truly one of the greats. Had the privilege of being a part of, and witness to some pretty incredible stuff thanks to the legend that was Keith Rose. An incredible sense of loss upon hearing this tragic news. RIP Keith. You will not be forgotten. May you find peace Keith Rose. Your legacy will still serve as inspiration for many, many years to come. RIP Keith. To one of South Africa’s best ever. RIP Keith Rose. MarkLives will be publishing tributes and industry reaction throughout the day. Please send us your tribute or reaction to be added to this page to , or leave one in our comments section below. Updated at 4.07pm on 12 November 2018. R.I.P Keith , you were a good man. My name is Melissa Brown, a good friend of Keith Rose. I had the privilege of reminding him of his great self worth on the 20/09/2018 by means of a letter. We discussed the subtle unboundedness of the Universe, all that he his, versus the gross relative world where we can find ourselves bound. Let us all reach for a miracle please in his Name, relinquish all grievances and pain, and bring Heaven to Earth. God is Great. Keith was without doubt, one of the country’s great cinematographers and commercial directors. His passing has left a void proliferated by charlatans – who have worked out how to point a camera and switch on a lamp without blowing a fuse – who now qualify as a DOP and Directors on productions. Like so much else, we are submerged in an industry of smoke and mirrors celebrating mediocrity. Keith was an artist in the most beautiful sense. I was truly privileged to have watched him bring a tiny idea of mine alive. My heart goes out to his family and close friends. It’s taken a whole week for me to process the loss of my little gentle friend Keith Rose. It’s been a week of raw emotions and a flood of memories for me. The first time I really got to know Keith was when he was a cheeky cameraman where we had an argument over the size of our studio. Although he reluctantly agreed to shoot in it he still made magic with our Red, Yellow, Blue Citi Golf Tv commercial which was the start of the biggest success story in the history of Volkswagen. Little did I know at that time that our joint careers would collide into a journey of gigantic proportions. Vw and Audi gave us the opportunity to travel around the world on numerous occasions which brought us closer together with memories I will cherish for ever. I share this loss with the many people who were part of this journey particularly our two German colleagues Peter Lony and Peter Naguschewski. Both of these guys loved Keith dearly. I was also lucky enough to meet up with Paula Viljoen and Caroline Foster(Fossie)this past week for a reminisce and a little cry. I will never forget all the great work we did together but also the fun an laughter we shared. Keith got me to do my first triple loop on a Roller Coaster at the October Fest in Germany. The many dinners and parties in Cannes and the long discussions about life and the meaning of it. Keith played by his rules and continued to be the magic maker he was. I loved seeing Keith becoming a family man. Standing on the side of a rugby field watching his kids play sport. His loss is felt across the globe and for me it’s raw,painful and very personal. A bundle of pure talent Kieth Rose was a giant of creativity and a humble soul. I feel so proud to have been part of his journey and will always remember him for being a kind lovable and generous person. My love, thoughts and support go out to all who loved him. After the devastating passing of our dear friend Keith ROSE, we would like to collect donations from friends, family or ex-colleagues for the family and to cover some emergency costs. Please help the grieving family by clicking the link below.